The Pew Research Center (3/1/18) recently released a survey on political attitudes by generation. “America is politically sorted by generations in a way it never has before,” was the takeaway of New York’s Jonathan Chait (3/1/18). Well, sort of; the generational divide is a striking feature of US politics, but it’s not exactly breaking news. What’s more striking to me in Pew’s findings is how voters of all generations have shifted to the left—mostly by becoming more consistently progressive, mostly in the last six or seven years. Ten percent of young people were “consistently liberal” (according to Pew’s survey) in 2011; in 2017, 25 percent were. Among Generation X (38- to 53-year-olds), the shift was from 9 to 16 percent, for Baby Boomers (54 to 72) it was 7 to 17 percent, and even among the Silent Generation (73 to 90) “consistent liberals” went from 7 to 12 percent. Meanwhile, neither “mostly liberals” nor conservatives of any stripe showed nearly as much growth. 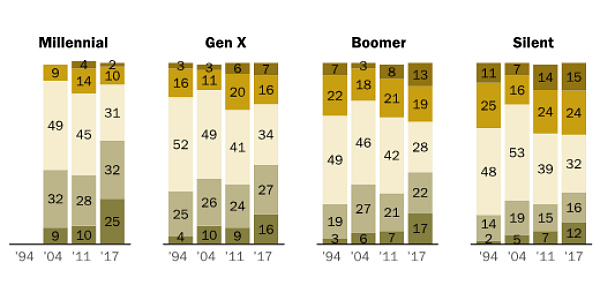 Pew Research Center (3/1/18) points out the generational differences, but the overall progressive trend is most striking. So what’s going here? Well, it reminds me of a similar shift that happened on the right a generation ago. When the project that became Pew, then under the aegis of the Times Mirror newspaper group, first started analyzing the US electorate in terms of political clusters—in 1988’s People, the Press and Politics report—it found, surprisingly, that “conservatives” didn’t really exist. That is, there was no significant group of voters that embraced what was then and now the overwhelming ideology of the Republican Party—socially repressive and economically favoring the rich. Instead, the Republican Party was a very successful coalition of mostly upscale pro-business voters who generally favored liberal social policies, and less affluent groups who voted against abortion and gay rights, even while their economic views leaned to the left. They voted Republican because each was willing to overlook the part of the GOP platform they didn’t care as much about. Staunch Conservatives are distinguished for their strong pro-business views, while registering almost no support for the needy, the environment, gun control, or the government. They are also highly critical of blacks and homosexuals. What had changed? From 1988 to 1999, we saw the rise of what FAIR has called “the right-wing media machine” (Extra!, 3–4/95)—with Rush Limbaugh getting a national radio talkshow in 1988, and Fox News Channel launching in 1996. These were the tent poles of a multimedia effort to reach a mass audience through an aggressively partisan right-wing message—presenting tax cuts for the rich, military adventurism, anti-environmentalism, unrestricted gun ownership, racism, misogyny and homophobia as interlocking parts of a coherent ideological system. The creation of this conservative mass base helped shift the Republican Party to the right and sustained GOP control of Congress for most of the 21st century. The same period did not see the rise of a mass-audience progressive media—because the media structure in the United States is based on corporate advertisers, who will not consistently support a genuinely progressive message that will inevitably be anti-corporate (Extra!, 11–12/03, 10/10). Rather than helping left-leaning voters develop a consistent left ideology, opinion media decision-makers sometimes seemed to see their main job as keeping progressives confused, safely tying socially liberal impulses to pro-corporate economics (Extra!, 9–10/04). A funny thing happened in the 21st century, though: People began to find ways around corporate media gatekeepers. The rise of social media platforms like Twitter and Facebook allowed people to share news and opinions directly, giving them an opportunity to gravitate towards outlets and outlooks that resonate with them. This is often presented in traditional media as a negative, even disastrous development: “Your Filter Bubble Is Destroying Democracy,” Wired (11/16) warned. And social media can indeed reinforce anti-social elements, as events like the Charlottesville white-supremacist march and the election of Donald Trump demonstrate. But the right-wing agenda, as noted, has its own media outlets. And the centrist media establishment is clearly more open to giving a platform to hateful views than to perspectives that threaten capitalism (FAIR.org, 5/2/17, 3/1/18).